The very slim acute point perfectly pierces fine densely woven microfiber fabrics and synthetic leather. Creates beautiful topstitching and edge stitching on silk and microfiber fabrics. 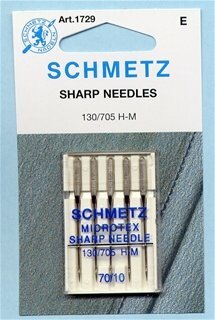 Sharp point use when perfectly straight stitch a desired, such as topstitching or folded pintucks.